"Who do you wanna be, Mason? What do you wanna do?" "I wanna take pictures. Make art." "Any dipshit can take pictures, Mason. Art, that's special. What can you bring to it that nobody else can?" Boyhood is love, Boyhood is life. This is not just the film that was 12 years in the making, it's 100 years in the making! Ever since the employees left the Lumiere Factory, ever since the train arrived at La Ciotat, and ever since George Melies' Trip to the Moon, Cinema has been building towards Richard Linklater's ground breaking masterpiece 'Boyhood'. Roger Ebert once said of David Lean's 1962 masterpiece 'Lawrence of Arabia' that ''what a bold, mad act of genius it was, to make "Lawrence of Arabia" or even to think that it could be made", this how I feel about Linklater and the creation of 'Boyhood'. To capture a child's growth from adolescence to adulthood via film, sounds like something a filmmaker would hypothesise about but never follow through with, Linkater is bold and daring enough to follow through with such a mad act, and in doing so, he has created one of the most incredible and special film experiences of the last century. Ellar Coltrane is Mason, the boy of 'Boyhood'. From the ages 5 to 18, we get to see a fresh faced adventurous young child grow into an independent artistic young adult, Coltrane's youth has been immortalised on film and it is such an unprecedented thrill to behold. It's difficult to call Coltrane's role in this film a ''performance'', because it never really feels like one, it's more like watching the main character of a documentary. Linklater is very sure of keeping this character grounded, making sure to display his changing personality through the years but still making sure the good hearted we were introduced to at the beginning still shines through. the character, like the film, is a tremendous achievement, both due to Linklater's writing and direction as well as Coltrane. It almost feels a little dismissive that the title of the film is simply 'Boyhood' as there are three other characters whose progression we witness through the course of the film. Loreleli Linklater playing Samantha (Mason's sister and Director Richard Linklater's real life daughter) also devotes her childhood to the film, and like with Coltrane, it's incredible to watch her grow into a young adult. The other two characters whose progression I was alluding to, is Mason and Sam's Mother and Father, played wonderfully by Patricia Arquette and Ethan Hawke. Arquette, in the performance of her career and an Oscar worthy performance if I've ever seen one, plays probably the most motherly mother character I have ever seen portrayed on film. A performance that is equal parts fragile and strong, the single mother character is the heart and soul of 'Boyhood' and she goes through a "parade of drunken assholes'' (as Mason says late in the film) and several occupations in order to make a good life for children, her final scene in the final scene in the film is fantastic (as are all her other ones). Ethan Hawke, in yet another stellar collaboration with Linklater, plays the divorced father,who comes off as much of a loveable child and Mason or Sam. He's the kind of guy who has reached his 30's yet is still living the life of a teenager, which makes it clear why his relationship with Arquette's character didn't work out. Yet in another masterstroke in Linklater's incredible piece of work, we also see Hawke's character grow into the man he should have been 20 years prior. One of the cornerstones of Linklater's career is his uncanny ability to write incredibly immersive dialogue, which is very present in 'Boyhood' but it serves a much different purpose in this film than it does in his 'Before' trilogy, 'The Waking Life' or 'Dazed and Confused', in this film it serves as almost a time capsule to represent the year in which we are in. Linklater's scatters clever little references to the time period through out, giving it even more of an authentic feel. While 'Boyhood' has rightfully received unanimous praise, it has also been released in a time where social media and what not is at its most prevalent, which means that even the greatest pieces of work will get hate from some corners of the internet. While it's certainly people's right to not like what they don't want too, i have read people that diss the film for the reasons that make it so special, my favorite of which being "people wouldn't like it if wasn't filmed over 12 years", that's kind of like saying that people wouldn't like childhood as much if it was only one year long. Of course, 'Boyhood' wouldn't be the same if it wasn't filmed over such a long period of time, 12 year long production is necessary if wanting to create such an authentic portrayal of life. Maybe it's because I am the same age as Mason (although my life has been very different to his) which is why 'Boyhood' has such a strong connection to me, few of which have ever had. This film will be a big part of life in the future, I look forward to revisiting it at every turn. At first, Cinema was of portraying our dreams, now it's a way of portraying our lives. 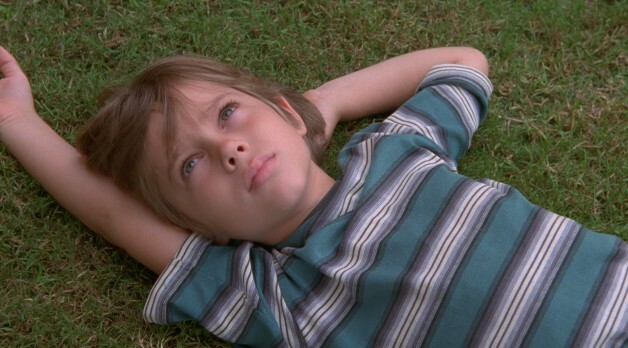 'Boyhood' is a bonafide cinematic masterpiece, in every sense.